Food, glorious food! From sushi to Swiss steak , caviar to chocolate mousse, there are 1,001 different ways to prepare a single item, and the highest demands of any industry. This is a field in which Cara excels as Canada's premier company providing meals for people on the go. Like most success stories, it all began with a company called Canadian Railway News. Fraser Biggs, Supervisor at Cara's Vancouver Flight Kitchen, provided a brief capsule of the company history. "We've been around for 130 years, firstly in the steamship business on the Niagara River; then we started catering to the railroads. Over a century later, we're still in the railroad business -- Rocky Mountain Railtours from Vancouver to Jasper, Banff and Calgary being prime customers. In the 1930s we entered the airline business, and by 1951 across Canada, Vancouver to Halifax, we served about 1,500 meals a day. Today the Vancouver Flight Kitchen alone provides over 12,000 meals daily. In round numbers, Cara enjoys 60 per cent of the airline business in Canada, and 40% of the Vancouver market; Air Canada, British Airways, KLM Royal Dutch Airlines, Singapore Airlines. Air China, American Airlines, United Airlines, Canada 3000 and Air Club, AirBC, Canadian Regional, Greyhound and WestJet -- all rely on Cara for their food service needs. BC Tel, which has its own small fleet of executive jets is part of its corporate market. Cara also supplies 3,000 hot meals a day to the Vancouver School Board. "I couldn't even guess the number of different menus we have. on file", said Biggs, "the whole operation is run by computer -- all our menus -- it's an ever- changing market. Where we have the edge is in service and dependability. " Cara saw the opportunity at Expo 86 to cater to an even broader range of countries and tastes, serving 5,000 people at the Expo Centre's Grand Opening. The Vancouver flight kitchen, second largest of 9 across Canada has 512 employees. A privately owned company, Cara trades on the stock exchange , and its restaurants include such famous names as Chicken Chalet, Harvey's and Second Cup. "Cara's a great company to work for", said Briggs. "We are very stable, treat our employees well and invest a lot of money in training." Airline food? Each airline has its own specifications and level of service, according to Briggs. "Air Canada has a good track record for the quality of its food. That's because they pay that much more for catering as opposed to some carriers. You have to appreciate that airlines are limited to space; under the circumstances they do a great job. We have a beautiful board room, and I can take the same food we prepare for a flight and serve it on nice china dishes --you'd never guess the difference. We have people in our boardroom for first class dinner and they're absolutely amazed." Cara's head chef actually creates the menus in concert with the airlines. For example, KLM Royal Dutch Airlines executive Chef in Amsterdam flies to Vancouver to consult with Cara's chef. It's the same with British Airways and others. Cara addresses the aspect of quality as follows; "If we've learned anything from being in the hospitality business for over 100 years, it's knowing how to keep our customer's concerns at the heart of everything we do. We listen, we learn, and we react! Listening, learning and reacting have led us to one main conclusion; it is our employees who make us what we are, and although they all possess the required skills and know-how, it is not until they have learned Cara. How do they earn the right to be called Quality Masters? 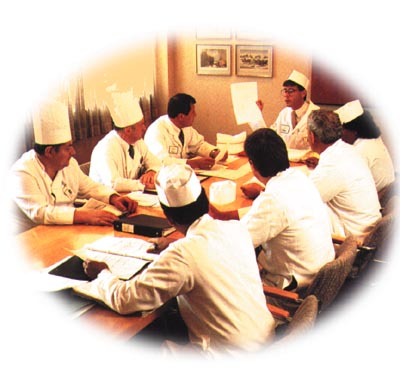 At Cara, our Quality Master program is a thorough educational process in which every employee must participate. From hourly employees to top level management, everyone benefits from the knowledge that this program provides. Most importantly, each employee gains an overview of the total scope of the Cara operation. This builds teamwork as well as strong individuals dedicated to doing the job right. The Cara employee is indeed your team player." A key part of an airline's in-flight Image, Cara takes this responsibility very seriously. There are so many complicated variables involved prior to the boarding and loading of a flight that one sometimes wonders how it could all possibly come together, but it does to such a high standard of excellence that Cara is proud to be a significant contributor and innovator within the Airline Catering Industry World-Wide. For information on Cara Airport Services, phone (604) 278-9144, fax (604) 278-4929.
. Father of American Cooking. More on food from Gourmet Spot (www.gourmetspot.com). Okanagan Wine Train is now on track! See our Adventure Rails section. Vancouver Wine Festival 2000. Ask us for details.